It is a letter addressed to the prime minister and his minister of finance Jim Flaherty, as well as the other party leaders and finance critics. Signatories include the presidents of the universities of Toronto, British Columbia, Manitoba, Western Ontario and Dalhousie. They are joined by representatives from health care, and arts organizations, United Way, foundations and gift planners. The letter is also signed by Tom d’Aquino, former president of the Canadian Council of Chief Executives and Catherine Swift, president of the Canadian Federation of Independent Business, indicating both big and small business support. The signatories celebrate the success of the Harper Economic Action Plan, which is the first curious point since that plan was more about marketing and Conservative Party brand management than actual economic stimulus. They then “commend” the Harper government for focussing on cutting the deficit, not by raising taxes or reducing transfer payments to the provinces, but by “significantly” cutting spending on education, health care, social services and arts and culture. They seem to be cheering Harper and Flaherty for the severe budget slashing widely anticipated in the forthcoming Conservative budget. We understand you need to slash spending on health care, education, social services and arts and culture, the letter says. Let us provide those services. We can do it if you give the wealthy another tax break when they donate the proceeds of selling shares in their private companies or pieces of their real estate empires to our charitable members. Let us—and not duly-elected governments—decide which programs and services are worthy of support. There’s less accountability this way. The wealthy will end up determining Canada’s social policies. If Harper accedes to this request, he no longer has to reinstate the funding once the ravages of the recession recede. He’ll probably do it. One of his first actions as prime minister was to amend the Income Tax Act to exempt from capital gains tax gifts of shares of public companies to charities. This is just the next step in the “long march” back to the nineteenth century. 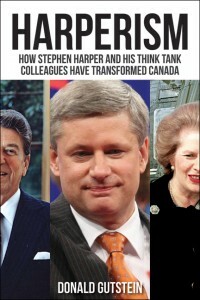 Change by increments, that’s the Harper way.